The Columbian taking on firewood from one of the many wood camps along the Yukon River. From the number of passengers observing the work, it was a moment of interest and entertainment. The photo was taken just 2 weeks before the tragedy. It was September 25, 1906, and the Columbian was carrying a small crew of 25 men, a full cargo of cattle, and blasting powder destined for a coal mine. About 50 kilometres south of Carmacks, on the Yukon River, a tragedy was played out. Enter the key players: a flock of birds overhead, Phillip Murray, a young deckhand who had a rifle aboard, and finally the ship’s fireman Edward Morgan. Against company policy prohibiting the discharge of a firearm aboard a vessel, Morgan asked Murray if he could borrow his rifle so as to take a shot at the birds. Somehow Morgan either stumbled or faltered, and the shot hit the ship’s deck. It ignited the large amount of blasting powder on the deck, and the ensuing explosion resulted in a fireball that spelled the end of the Columbian. The ship’s captain was in the wheelhouse and protected from the explosion. Unable to control the fire aboard vessel, he and the engineer managed to manoeuvre the ship into the riverbank where crew members were able to jump ashore. Although the captain and crew did their best to minimize the damage, five men and 21 cattle were killed in the accident. Five men, including Murray and Morgan died immediately. The purser Lionel Cowper had been burned over his entire body. He was wrapped in an oil blanket and taken to Whitehorse for treatment, where he finally passed away about two weeks later. The body of another crew member, Joe Welsh, was not found until 2 months later. The luckiest crew member was Ernest Winstanley who was the only person in the near vicinity of the explosion to survive. Apparently the woolen underwear he was wearing protected him from the flames. Except for scars on his wrists, ankles and face he made a full recovery. 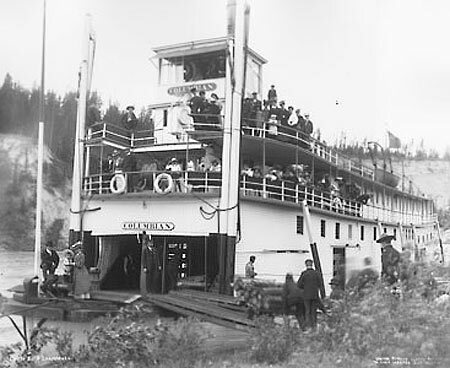 The remaining wreckage was later floated down current to a side channel of the Yukon River so as to not interfere or impede boat traffic. In October 1906, there was a coroner’s inquest into the deaths. It placed no blame on the surviving crew.